It is one of the great joys of my life to be involved with Meredith and Golden Plains. I have seen so many happy people enjoy the festivals over the years and that in itself brings me tremendous joy. I am not going to attempt to find the words to sum up all that here in this letter; (no, I’m not retiring) but I wanted to take a moment to talk about one very important – in fact vital – aspect of those lovely weekends in the country. I’m not even sure what name to put to it. It’s the part that never ceases to amaze me, that honestly re-affirms my faith in humankind (and I can be a cynical old bird). 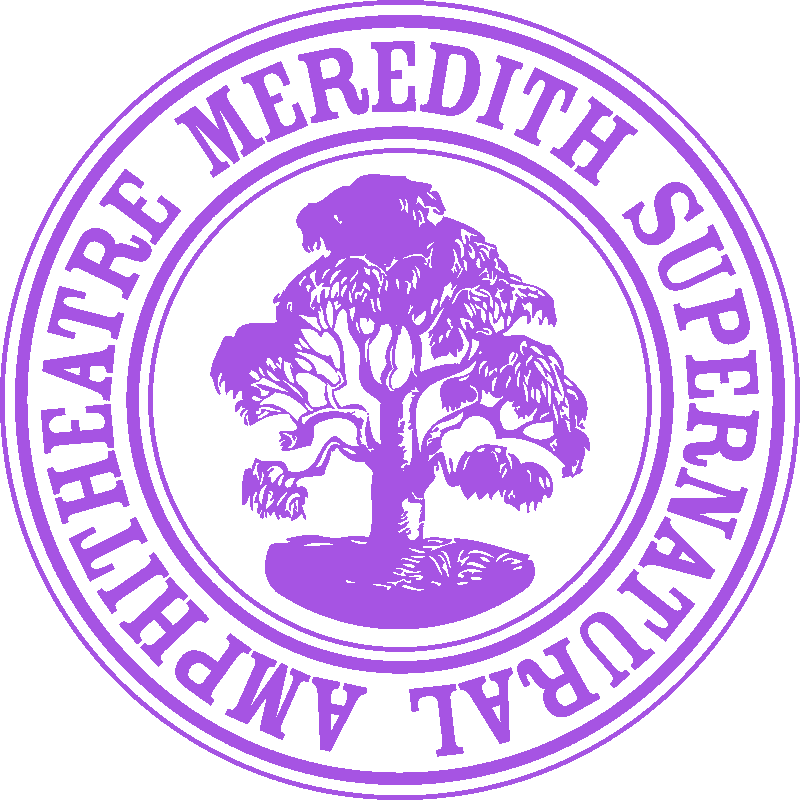 It has been variously referred to as the spirit of Meredith, the essence of Meredith, the original ethos, the vibe of the place, the atmosphere of The Sup’, Magic O’Clock, etcetera. It displays itself in how well people treat each other out here, from wishing strangers a “Happy Meredith” to cash-intact wallets handed in at Lost & Found, to doing the ‘CleanUp Dance’ in the Amphitheatre, to the offers of help on those rare occasions when the chips are down. Basically, I’m talking about how well everyone gets on with each other, the land (and themselves) while having a whale of a time. Sure, Uncle Doug, the team and I play our part, but really it comes down to good people doing good things, and that happens so often out here over those long weekends. I want to acknowledge that, and make sure you know it is a vital part of Meredith and Golden Plains. I’d also like to touch on a few ways in which this wonderful convention can keep on rolling. This started in about 1993 when it was clear one of the things Meredith-goers liked most was the lack of dickhead behaviour. We are careful to keep working on this every year and protect the integrity of MMF and GP. For example, we know people like plenty of time and space, so we chose to reduce Meredith in size by 500 people. We also know how angry Meredith-and-GP-goers get when they see thieves and scalpers trying to rob and scam people for tickets through sites like ebay and Gumtree (recently one of these scammers received a 3-month jail sentence); hence the introduction of Aunty’s Golden Waitlist this year, a no-cost service that keeps tickets and hard earned cash out of the hands of dickheads. Couches and furniture are a unique part of Meredith and Golden Plains, and we are not about to mess with that. But some people do not take home what they bring, which means we are left to dispose of tens of tonnes of hard rubbish. This is not cool!! The Sup’ is a working farm and these items have no place left here. We spend a lot of time and energy refining our waste practices to reduce landfill by the maximum possible amount, and dumping these items here works directly against that. We think it’s absolutely fair enough that we collect, sort and recycle most of the ‘waste’ on site – from litter to cans to food waste and even human waste – that’s our responsibility and we take it seriously. But couches, gazebos, discarded cheap tents and other furniture is the responsibility of the bringer. If you bring it in, you should take it out – the Supernatural Amphitheatre is not a dumping ground. So please – when you are planning your trip to Meredith and/or Golden Plains this season, keep in mind that those items need to travel home with you. Maybe bring some extra ropes or tie-downs so you can easily get them back into/onto your vehicle on exit. Couches, gazebos and tents are not disposable items – it is wasteful to treat them as though they are. Packing up your campsite includes taking home your furniture. Please! And thankyou. There has been a growing number of Meredith and GP-goers who write to me to express their anger and disgust at the small but disappointing number of cheaters and scammers who try to get into the festival without a valid ticket. Apart from making the festival slightly fuller, getting in when others didn’t and usually being dickheads, these trespassers also brought with them other serious issues, including risking injury by walking through worksites, farms, dangerous unknown terrain and of course intruding on the natural habitat of some rather venomous reptiles. They brought a bushfire risk by way of cigarettes and their vehicles blocking access roads and gates. A few years ago, we started a ‘Zero Tolerance’ approach to people trying to get in without a valid ticket, be it on foot, in vehicle or other means. We put a process in place with the help of locals, neighbours, Victoria Police and our security team (who have been with us for over fifteen years and understand the festivals well). It’s here if you want to take a look. You may see in the news that this month (November 2013), 18 people are due to appear in court charged with trespass in relation to the festivals. The maximum penalty is approximately $2750 or 6 months imprisonment. There are also other ramifications – I can tell you that some people who have been caught trespassing have begged not to be charged as a criminal conviction would wipe out their employment prospects and in many cases means being removed from current employment. We will continue to enforce the Zero Tolerance approach with the support of the local community, Victoria Police and many legit festival-goers. As I say, festival-goers and those who missed out on tickets are now regularly expressing to me their intense disappointment at people who try to scam or cheat their way in. In fact they often give anonymous (and not anonymous) tip-offs about how and when these nefarious activities are intended. Attempting to get into the festival without a valid ticket is not a harmless bit of fun – it has serious consequences. Trespass is not just against the law: it is a massive breach of the ‘No Dickhead Policy’. And that’s something we have to take very seriously, because nothing can come between Meredith, Golden Plains and the integrity of the experience. Thanks for your time and please continue to look after yourself and each other.